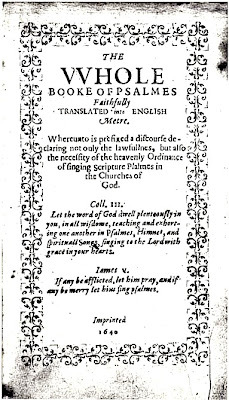 "...we have therefore done our endeavor to make a plain and familiar translation of the psalms and words of David into English metre, and have not so much as presumed to paraphrase to give the sense of his meaning in other words; we have therefore attended herein as our chief guide the original, shunning all additions, except such as even the best translators of them in prose supply, avoiding all material detractions from words or sense." From the introduction to the Bay Psalm Book, 1640. THE WHOLE BOOKE OF PSALMES. Faithfully translated into English Metre. (The Bay Psalm Book.) [Cambridge, Mass.] : Imprinted by S. Daye, 1640. Compiled and translated by John Cotton; Richard Mather; John Eliot; Thomas Weld; Stephen Day; Matthew Day; Adrian Van Sinderen. The Bay Psalm Book was the common hymnal of the Massachusetts Bay colony. An American icon, a piece of heroic history - it was both the first book printed in the Colonies and it was also the first book entirely written in the Colonies. Printed 20 years after the first arrivals in Plymouth in 1620 on the first printing press in New England which was purchased and imported from London specifically to print this book. In 1639 the press printed first the Freeman’s Oath and then an almanac, no copies of which are extant. The mind boggles at the value that could be attached to these. The translations were prepared by a committee of approximately thirty clergymen, including Richard Mather, John Eliot, and Thomas Weld. The preface is generally attributed to Mather, although some scholars believe it was written by John Cotton. The book went through several editions and was in use for well over 100 years. Later editions had tunes and music which are not to be found in the first edition. The poetry of the versifications in the first edition is often crude and awkward, but the writers considered faithfulness to the scriptures to be more important than poetic elegance. In spite of this, the Bay Psalm Book achieved considerable recognition in its time, a recognition that went well outside of New England, and even the Colonies. Copies reached both England and Scotland and saw some use there. A BEAUTIFUL and ABSOLUTELY PERFECT copy; having the additional page of “Faults escaped in printing.” The binding---one of Mr. F. BEDFORD’S master-pieces---is in dark brown crushed levant morocco, the sides studded with gold stars, within broad gilt borders, with corner and center ornaments; and the volume is enclosed in a Solander case of blue, straight-grained morocco, lettered. To offer any remarks on the RARITY or the IMPORTANCE of this precious volume would be sheer impertinence. The acquisition of a copy of the original edition of the Bay Psalm Book must always be the crowning triumph to which every American collector aspires,---while the chances of acquisition are constantly diminishing. It is by no means probable that another copy will be offered for competition within the next quarter of a century, at least. It is hard to extrapolate from $151,000 in 1947 but you could probably buy a sizeable block of flats in a decent part of New York at that time. Also there is a greater market for fine Americana now and a whole lot more money about. The book probably wouldn't make the value of a Warhol car crash but could top $20 million. It is intriguing that copies made it back to Britain and I shall be paying close attention to small 17th Century books of psalms - even incomplete copies. 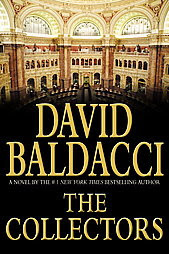 [ TRIVIA ] There have been at least 2 bibliomysteries featuring the book --'The Bay Psalm Book Murders' by Will Harris (1983) and 'The Collectors' (2006) a great piece of hokum featuring some downy old birds calling themselves the Camel Club. Jonathan Dehaven, the director of the Library of Congress' Rare Books and Special Collections Section is found dead under suspicious circumstances. A copy of the 1640 Bays Psalm book is found among his own rare book collection at his posh house...The book also features a dodgy rare book dealer, wily collectors and librarians. Not a bad valuation Bookrider. 6 years later a copy (not esp nice) has made $14 million! I was out at $8 million! Got to keep something for retirement!